WSU's first queer prom was a success, boasting over 50 happy attendants throughout the gender and sexuality spectrum. Photo courtesy of WSU Radio, @wsuradio with text added. High school prom night: a notoriously stressful night. It’s an evening full of drama, deciding attires, makeup, and messy dates on a night when high schoolers try to have fun making friends and dancing. 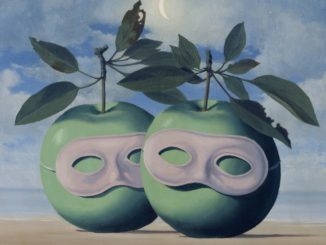 However, people in the LGBT+ spectrum may feel increased pressure and may even hide their identities. High school prom is notoriously heterosexual, and those who identify in the LGBT+ (nonheterosexual or gender nonconforming) spectrum may feel uncomfortable in such situations. 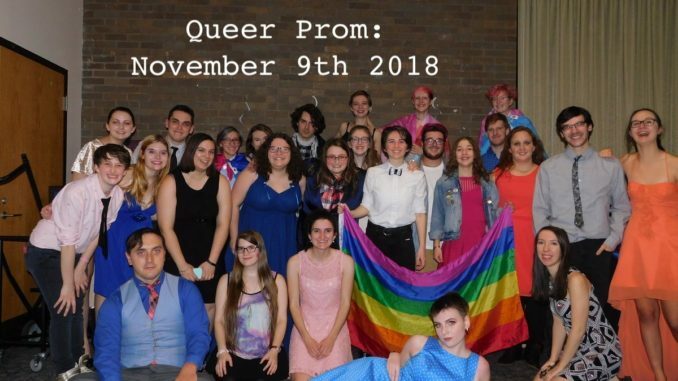 In contrast, the pride alliances at Worcester State University and Clark University with the help of Worcester State’s Student Event Committee created a queer prom night where everyone can feel comfortable in their skin. The prom was held 8 to 11 p.m., Friday, Nov. 9 in the Blue Lounge on campus. Those who agreed to help set up arrived to the Student Center at 6 p.m. on prom night. Once arriving at the Blue Lounge, WSU students were greeted by peers from Clark University, who were also assisting in the set-up. The prom was outer space-themed: star-shaped balloons around the room. Decorations also included LGBT+ flags, rainbow-colored streamers, and ornaments with colors aligning with the LGBT+ community, all welcoming guests to this happy environment. Once fully decorated, the Blue Lounge was full of color. Guests began arriving in number at 8 p.m. The music played was reminiscent of high school proms but included many LGBT+ related themes. The combined pride alliances primarily played old music and Broadway music, for example, songs from the musical Hamilton. The most popular songs included “Africa” by Toto, Mary Lambert’s cover of “She Keeps Me Warm” by Macklemore, and “Don’t Stop Believing” by Journey, which everyone danced to. “Don’t Stop Believing” was particularly popular tonight and in the LGBT+ community because of its symbolism. Liz Callan, a senior at Worcester State majoring in sociology, said, “I went because I was asked to the prom prior. I’ve decided to try and be social, so I wouldn’t regret it later on.” At the Queer Prom, Callan requested the song “She Keeps Me Warm.” She mentioned that this was a good song to reflect upon for the LGBT+ community. 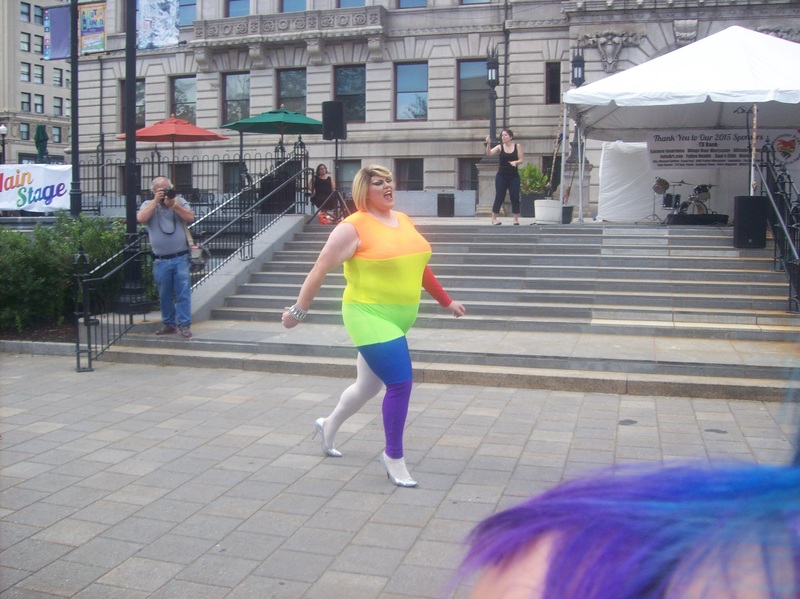 The Queer Prom is one of many events the pride alliance hosts. There are a lot of events that are fun but serious and sad at the same time. Past events include the popular coming out stories, karaoke, and Jeopardy (as part of Late Night Lancers held on Thursdays), and hanging out with the Clark University pride alliance. Attendees met up with old friends and made new ones to share new memories with. There was an atmosphere of acceptance, everyone fit right in, even those who are usually shy during social events. One of the mottos of the LGBT+ community was very true for this evening: Love Is Love. Synk can be contacted at ssynk@worcester.edu. This piece was edited by F’18 NWS staff prior to publication.